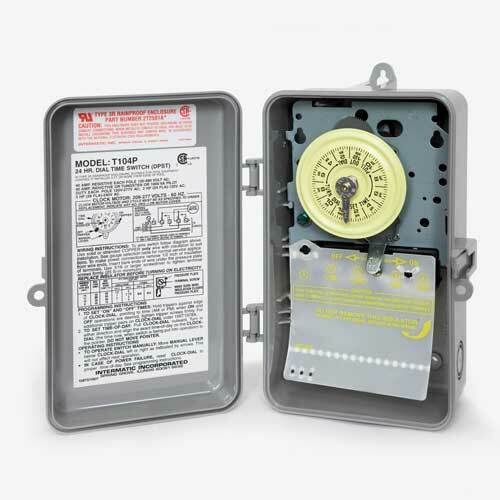 This industrial-rated outdoor timer is perfect for our 230-volt fountains and aerators. Manufactured by Intermatic, this heavy-duty timer is designed to save energy while extending the life of your Scott Aerator product. Its clock motors are self-lubricating, and its manual on/off override switch won't alter your program. An easy-to-follow wiring diagram and easy-set design makes this a perfect timer for both residential and commercial applications. This 208- to 277-voltage, 40-amp timer is rated at 5-hp maximum at 240 volts, and has a maximum of 12 cycles. Includes two trippers.